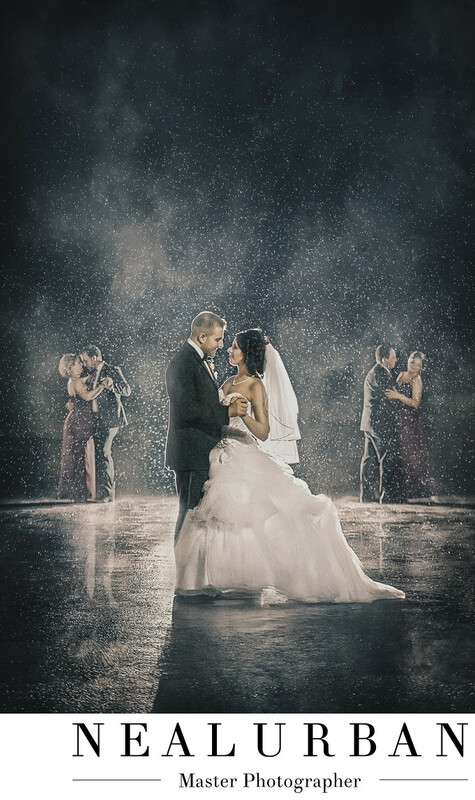 An all time favorite wedding image! This image is so magical and has a great story. This image is based off of painting by Jack Vettriano called Dance with me my Love. Neal had this idea in mind before the actual wedding day. We photographed the two other couples in this image. Both girls were bridesmaids in the wedding party. We wanted to incorporate them in some way! We get to the bride's parents house and take a look around to see what we are working with. Neal stumbles upon the painting by Vettriano and is shocked that it's a favorite of Nina's mom. We couldn't believe it. This was meant to be! The wedding day went great! Then we get to the reception at Antonio's Banquet and Conference Center in Niagara Falls. Neal is so excited for this end of the night shot. However, it was not raining. We may be the only photographers that want it to rain at some point during a wedding. The reception was going strong and the dance floor was packed. We pulled Nina and Vinny, and the two other couples and told them the idea. They all know how crazy we can be for ideas! They were all on board and ready for action. We just needed it to rain. We were pretty much done with capturing the party, so Neal continued to check the doppler and outside. Antonio's does not have much around it for photo opportunities either. But, we did have an open parking lot. That would do just fine. Low and behold it starts to rain. We tell everyone to get ready. Neal and I went out first to get all the lighting set up. We knew we needed at least two lights behind them and one in front. I passed out umbrellas and told everyone everything was good to go. We showed everyone inside exactly the poses we needed them to be in. We all go outside and get into position. On the count of three, we had everyone throw their umbrellas, get into their poses, and Neal snapped the shot. Thirty seconds later, the party was back inside on the dance floor. We do not always need a picture perfect back drop for photos. Sometimes a parking lot will have to do! Location: 7708 Niagara Falls Blvd, Niagara Falls, NY 14304.